The 2018 Ford C-MAX is a popular compact hybrid that sports a spacious interior for all the essentials. It has versatile seating options and additional storage for those instances when you want to keep valuables out of sight. The C-MAX has enough room to comfortably seat five passengers. The second row of seats can be folded down in a 60/40 configuration to maximize your cargo area. When the seats are down, you have approximately 52.6 cubic feet of room. Without it, you still have about 24.5 cubic feet of room. Behind the driver's seat, you'll find in-floor storage. Simply lift up on the flush handle to expose a hidden compartment. It has enough room to keep electronics, cords, and other valuables safe. 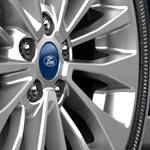 We invite you to visit us at Mullinax Ford of Kissimmee today. We'll give you a tour of the 2018 Ford C-MAX lineup and set you up for a test drive.